Allied forces during WWII used a special Michelin map of Normandy on that fateful day June 6, 1944 to plan the invasion. You can even use those famous Michelin Guides to find the best restaurants in the world and the greatest chefs. Michelin has supported the military through the innovation of the Space Shuttle Tire the specialized tire for the MRAPs. 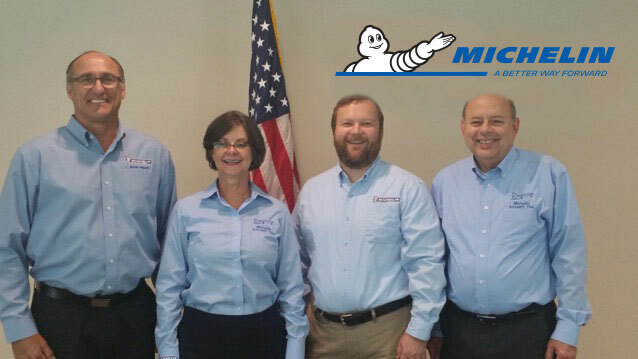 Michelin Veterans Business Resource Group officially launched June 16, 2015 and i open to Veterans and Non-Veterans. We exist to leverage Veterans’ experiences, knowledge, and leadership in a collaborative environment; to develop and mentor employees on all matters related to Veteran recruitment, retention and integration in bridging the gaps between military and civillian experiences. I am both humbled and honored to have served our great nation in the U.S. Army as a Support Operations Manager. Thanks to Michelin North America, I have the awesome privilege to give back and continue supporting my fellow veterans through the Veterans Business Resource Group. I am privileged to manage Original Equipment manufacturer tire contracts for fighter jets for Michelin North America. I am also fortunate to be the co-chair and charter member of the Michelin Veterans Business Resource Group. Our goal is to develop and mentor employees on all matters related to Veteran recruitment, retention and reintegration. I am honored to have served this great nation as a member of the Navy’s Supply Corps, and now I am honored to serve and support our Veteran community as a co-chair of the Michelin North America Veterans Business Resource Group. At Michelin, I am privileged to manage OE manufacturer and Replacement Market tire accounts for all US Military aircraft tires. Additionally, I am fortunate to be in the Event Planning/ Marketing leadership, and charter member of the Michelin Veterans Busines Resource Group. Our goal is to develop and mentor employees on all matters related to Veteran recruitment, retention, and reintegration.